It’s clear from the opening scene of ‘Madama Butterfly’ what the story’s conclusion will be. 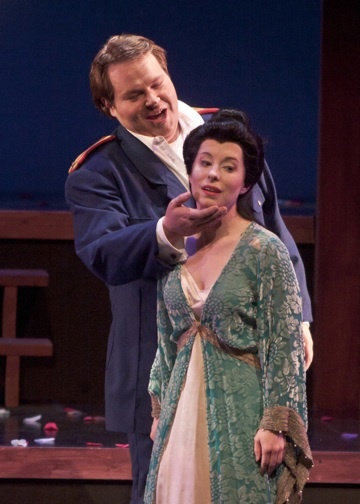 Even if one doesn’t know the opera, Pinkerton’s cavalier and unabashed sexual exploitation of the delicate geisha Cio-Cio-San can only lead to her devastation and his remorse. It’s a story no one wants to watch, but which ensnares everyone in its terrible momentum. This inevitability is compounded by the opera’s popularity. As one of the two most popular operas—the other being Puccini’s ‘La Bohème’—it appears over and over on the opera stage, which currently supports only the occasional original contemporary work. Few theatergoers are ignorant of the story. Any production, therefore, has to struggle with the contradictions set up by the forces of this opera’s inevitability and popularity. The story demands it be set in early 20th-century Japan. Without a commitment to that setting, Pinkerton’s imperialistic motives and Cio-Cio-San’s vulnerability and suicide make no sense. No urban America, with drug lords and prostitutes, would seem plausible. And the politics need no updating to be relevant to a 21st-century audience. It wasn’t a surprise then to see the Festival Opera’s rather conservative treatment of ‘Madama Butterfly’ this past weekend at the Lesher Center for the Arts. What was gratifying, however, was Director Brian Staffenbiel’s tasteful use of Japanese detailing and the way in which he uses Christine Marie’s shadow design as an emblematic way of moving the plot forward. Matthew Antaky’s sets and lighting provided a neutral canvas on which singers and shadows unfolded the action. Happiest of all in this production, though, was the truly wonderful singing by Teresa Eickel as Cio-Cio-San. In this emotionally complex role, which swings between an ecstatic innocence and crushing despair, Eickel maintained a tonal loveliness throughout that was unwavering, lyrical, and beautifully phrased. Tenor Christopher Bengochea made the best of a character everyone loves to hate, Lt. B. F. Pinkerton. And the love duet between the two that ends the first act was pleasing, almost as pleasing as the exquisite second act duet between Cio-Cio-San and her maid Suzuki, sung by Nicole Takesono. Philip Skinner sang Sharpless in a rich voice that now and then seemed too big, but easily handled the role of the kind-hearted though ineffectual consul. Only the rather bizarre costuming by Christine Crook seemed out of keeping. Its rather awkward and westernized look was a distraction, forcing the viewer to wonder about what and why the characters were wearing what they were wearing. Extra points go to Kirk Wolfgang Krikorian for maintaining his aplomb and staying on pitch while sporting red briefs under a robe of glitter encrusted banners in his role as Prince Yamadori. All in all, however, this was an engaging production, allowing us to once again exult in Puccini’s lush fields of sensual music. Joseph Marcheso conducted. The final performances of the Festival Opera’s ‘Madama Butterfly’ run Friday, July 16, at 8 p.m. and Sunday, July 18 at 2 p.m. For information and tickets, call (925) 944-9610 or visit www.festivalopera.com. Photo: Teresa Eickel as Cio-Cio-San and Christopher Bengochea singing Lt. B. F. Pinkerton.